Well, the Emmys certainly sucked. I never knew I could hate the cast and crew of Everybody Loves Raymond so passionately until last Sunday night. It's my own fault I guess. I shouldn't even try to watch the big telecast when I know they so rarely award quality shows and performances. I mean when a ham like William Shatner can win two years in a roll while a brilliant actor like Ian McShane gets snubbed, you have to wonder about the "arts" in the Academy of Television Arts & Sciences. Maybe Arrested Development's big win last year gave me hope that the Emmys could actually award the best of the best. However, I got my reality check Sunday when I was sadly reminded the so-called Academy prefers to hand out their trinkets to dinosaur poop. On a more positive note, I received two new comic books from Dale Martin last Thursday and that is certainly a good thing! I think I have previously mentioned somewhere about how much I love Dale's comics and, if I have not, let me state for the record that I love Dale Martin's comic books! Dale's work is always top notch fun and his latest material does not disappoint. One of the comics Dale sent me was the newest issue of Watusi the Talking Dog, a collection of jam comics that occasionally features a panel or two of mine. Watusi recently encountered a familiar Funky Idiot in one of his strips and this historic meeting can finally be seen here! Here's some random thoughts about the comic books I recently purchased. On the cover, the Outsiders look extremely ticked off. You would think they would be happy I bought their comic, but not this bunch! Things don't improve much on the inside. Everybody is mopey, drunk, and blowing up buildings. Maybe things will get better next issue. We finally see a side of Yorick that we haven't seen before. This comic really appeals to my inner DC fanboy. Villains galore and then some. Gail Simone is doing a great job with The Secret Six and the Society. Nice to see the return of Lady Quark and the Pariah, too. Looking forward to the next issue! 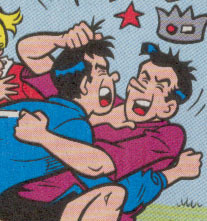 Jughead is a hair puller. Keep that in mind when you want to pick a fight with Forsythe Jones. And, yes, I collect Jughead and I'm not ashamed to admit it! Another three day weekend is over and done. I spent my time doing laundry, sleeping in, and attending family gatherings. Went to Aunt Carol's for a cook-out on Sunday and, on Saturday, I helped celebrate my niece Maddie's fifth birthday over at her grandparents. At that party, my other niece Keeley told me I was "slightly annoying". Slightly stung, I tried to impress her by taking her around her grandpa's pond in a paddleboat. I think it was a sign of things to come when I boarded the craft and it slightly submerged into the water. Then the paddling began and Uncle Tom's leg muscles quickly gave out. After going around in a circle for ten minutes, I threw in the towel and limped the vessel back to shore. Keke was disappointed and I'm sure her opinion of her uncle did not improve. I Say It's Their Birthdays, but Not My Birthday, Too Yeah! It's about four o'clock in the morning as I write this. Five years ago at this time I was at Ball Memorial Hospital, holding a little baby girl who was just born a few minutes after midnight. That baby was my niece Maddie and it's hard to believe that little baby is turning five today, but she is. 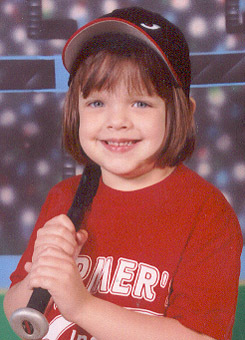 Happy Birthday, Maddie! Today is also my Uncle Jerry's birthday and, though I wasn't present a couple hours after his birth, I hope he has a great birthday as well! Happy Birthday, Uncle Jerry!